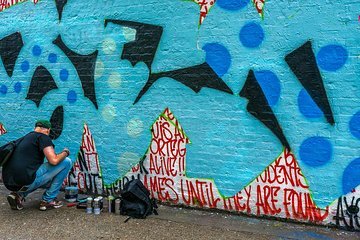 East London is home to a thriving street art scene that constantly changes — colorful graffiti are regularly removed by the council, rendering Shoreditch and Spitalfields’ art ephemeral. On this 2-hour walking tour, you’ll visit current street art and learn about East London’s rich artistic heritage. Stroll the iconic Brick Lane, passing Indian restaurants and vintage shops, and capture amazing images on your camera. Small-group tour, limited to 15 people. Greet your guide at an east London location and embark on your street art tour of the artistic area. As you explore the fashionable neighborhood, your local guide will reveal the history and heritage of Shoreditch and Spitalfields, detailing the radical transformation that they have recently undergone. Marvel at a transient tableau of street art, some of which has been freshly painted by notable artists. See, too, the iconic Brick Lane — replete with Indian restaurants and vintage shops — and receive recommendations for eateries and bars from your guide. On Brick Lane, with a camera full of vibrant images, bid your guide farewell and continue exploring independently.